The TD/TS Series MCCB–molded case circuit breakers–main function are to protect electrical applications form short circuit or earth leakage, overload current and under-voltage conditions. These devices are used to isolate the power, or to trip the power, at the time of fault in line and thus save the circuit from further damage. 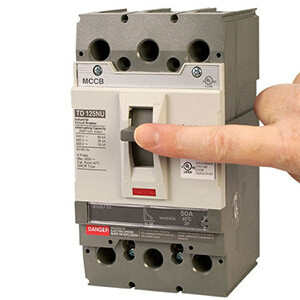 MCCB’s are well suited for OEM designed equipment in both light commercial and industrial applications. Their compact size saves space and reduces overall panel size and the field-installable accessories allow for last minute changes. The TD/TS Series MCCB’s are available with three different trip units that are installed in the housing; FTU–fixed-thermal and fixed magnetic; FMU–adjustable-thermal and fixed magnetic; ATU-adjustable-thermal and adjustable-magnetic. The following internal electrical accessories are also available auxiliary and alarm switches, shunt releases, and under voltage releases. View Specs above for specifications. Note: Comes complete with line and load terminal lugs and operator’s manual. Note: For adjustable-thermal/fixed-magnetic (FMU), or adjustable-thermal/Adjustable-magnetic (ATU), visit omega.com/auto for selection. Indoor-Outdoor Enclosures with Provisions for Disconnect - Sizes from 60x49 to 72x73"